The extension for Chrome and Firefox browsers called ProxMate will give us access to a wide range of sites which are not available by default in our country. Although the Internet and theoretically has no limits to the artificial barriers we have to constantly come up against. Some of them are erected for political purposes, while others are built for commercial reasons. For example, when you try to view some clips of service YouTube, you can run into an ad, this video is not available in your country. 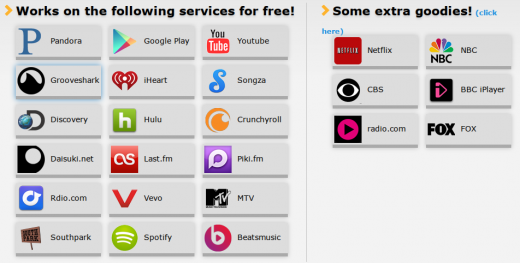 Likewise, for us to shut down popular music services like Pandora, Spotify, Hulu, MTV, Rdio, and so on. However, there is an easy way to overcome all these obstacles, and it’s called ProxMate. 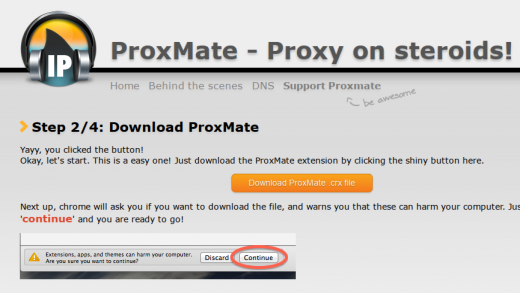 ProxMate – is an extension for the browsers Chrome and Firefox, which works on the principle of the proxy server and replaces your true location. A common problem with this method is that, when redirecting all traffic through a proxy, there is a significant slowdown in the speed of the connection. However ProxMate only handles requests to specific sites from the list, so using this extension should not affect your normal work. 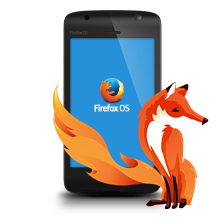 The extension for the Firefox browser becoming the usual way from the directory extensions, but with the Chrome browser is not as simple as installing ProxMate have not from Chrome Web Store, and from the developer’s site. However, there also is a detailed guide, so that you can easily manage. After the installation does not require any configuration, and you immediately get access to the site you want. Enable or disable the proxy, you can click on the icon on the toolbar extensions. If you wish, you can use the paid version of the extension, which will provide you with ready access to a wider range of sites.